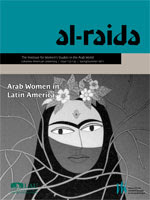 This special volume of al-Raida on “Arab Women in Latin America” makes a timely contribution to the scholarship of Levantine migration to what used to be called the New World, and which has inexorably linked the Levant and Latin America for well over a century now. It is well-known that the collapse of the late Ottoman Empire at the turn of the last century and the open immigration policies of Latin American countries were the main drivers behind Lebanese, Syrian, and Palestinian migration to the region. Much less understood, however, are the experiences of Arab women and the role they played in both cultural preservation and integration into the distinct host societies, in large measure due to a lack of archival documentation and the implicit unreliability, however useful, of oral family histories. It is this largely ignored lacuna that the following pages attempt to address.